What is causing all this commotion? Before I’ m going to discuss the relation between cell phone usage and brain cancer, I’ll give a brief introduction on cell phone history and technology. The following is based on the work of Vini G. Khurana et al. which they published in 2009 in Surgical Neurology. 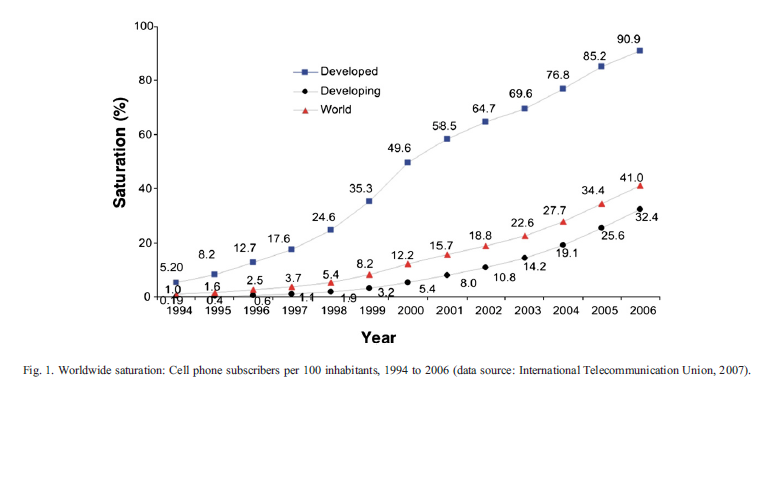 Cell phones have been mass deployed since the mid 1990’s in most countries. At that time the 2G network was the standard, nowdays the 3G network is used which is based on adaptations of code division multiple access, or CDMA, and time division multiple access, or TDMA (800 and 1900 MHz). Like inionisating radiation it is the energy of the radiation that is responsible for its possible harmfullness. This energy is reflected in the power outputs of the radio waves of the cell phones. Modern GSM handsets have a peak power of 1 to 2 W, whereas other digital celular technologies have power outputs of below 1 W, levels generally regarded as being safe by international regulatory authorities. Trough “adapitive power control”, the power generated by a cell phone can vary during a conversation according to the amount of interference with the signal. This can happen when the user is in a moving vehicle or within a building or elevator. During handovers, the moment at which the user moves from one geographic arae to another, the signal interference is generally at its greatest and therefore the power output at its highest. The output power of the new 3G is measured to be between 0.25mW and 12mW depending on the cell phone model. The power output of GSM antennae are far greater than cell phones and are associated with transmitter powers of 10 to 100W. In urban areas antennae use less power on average than in rural areas. In this latter one the base power output is much higher because of the vast areas requiring coverage between sparsely distributed base stations and cell phones rurraly are more often at their maximum power output during use in order to maintain good communication. 3 Responses to What is causing all this commotion? This is a very nice introduction to the subject. One thing that I want to mention is that I don’t fully understand the applicability of the graph in this story. Do you want to make a point that the more cellphone adopters, the higher the radiation? Is there a relation between those factors? The graph is a brief overview on the increase of cell phone users over the years. True, I could’ve discussed it more why I’ve put it in there, but since I’ve only been talking about cell phones in general I didn’t think it was necessary. As I said, it just shows that since the mid 1990’s, cell phones become more popular over the years. Like they say in the Dutch language: you hit the nail on it’s head. If there was a conclusive answer to this question there wouldn’t be a discussion. At present day many studies state that cell phone usage doesn’t cause brain cancer while others state it does. So the literature is not clear on this subject. The direction I chose for this blog is not to find the right answer to your question. I’m not an expert on the matter so I couldn’t give it to you anyway. I can only discuss the information that is published regarding the subject. I want to give an overview of the arguments of both sides and would like to discuss with you whether or not they are plausible.